It was September 19, 1965 at the Cotton Bowl in Texas. The Dallas Cowboys opened up their season at home against the 1964 title game runners up, The New York Giants. Over 59,000 fans came out to watch their ‘boys, and it also happened to be the debut of the two Tokyo Olympians, and arguably two of the fastest men in the world: Cowboy receiver Bob Hayes, the 100-meter gold medalist and Giant defensive back Henry Carr, the 200-meter gold medalist. As Hayes told the story in his autobiography, Run, Bullet, Run, the Cowboy were up 24-2 on the Giants. The Cowboys had the ball, second and 4 from the Giants 45 (in other words, 45 yards from the end zone and a touchdown). Dallas quarterback, Don Meredith, tossed a somewhat wobbly ball into the right flat that Hayes caught. He waited for his blockers, spied an opening, and headed for the goal line. Carr and his teammate Jim Patton had a bead on Hayes and converged on the Bullet at the 25 yard line, “but when they reached that point, I was already 5 yards past them. “I’ve never seen this in the NFL, where defensive backs judge the angle and then get there and are lost, “Dallas head coach Tom Landry said. As they say, speed kills. According to this video, #2 Bob Hayes Top Ten Fastest Players (in the NFL), Hayes was revolutionary. His speed stretched the field like no one had done before. Man to man was the de rigeur defense, but coaches had to develop new zone schemes to contain the Bullet. 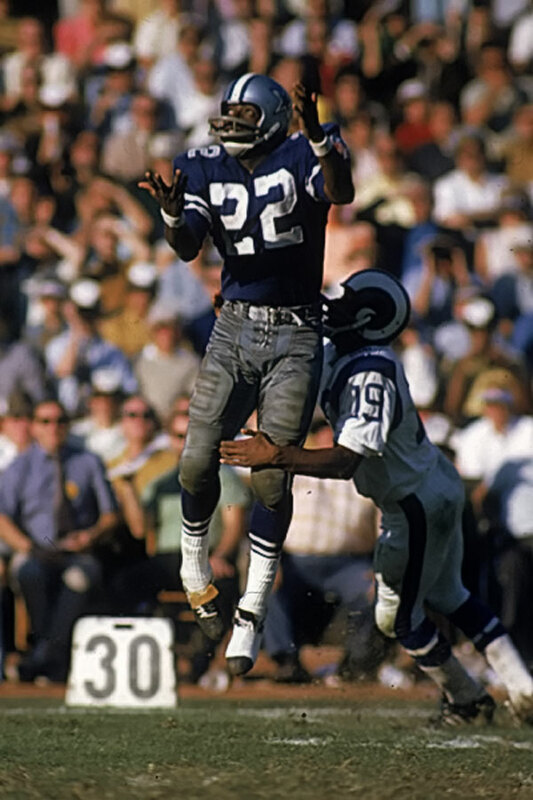 According to Dallas quarterback, Roger Staubach, who played with Hayes in the latter half of the Bullet’s career, ” He got these guys from man-to-man, they played a lot more zone, and I think he was kind of a game changer.” Remember, this was the age when defenders could do almost anything they wanted to a wide receiver short of armed robbery. So to create space, Hayes made the quick screen a thing of beauty. Over 11 seasons and 132 games, the double gold medalist and running back from Florida A&M, caught 371 passes, 71 for touchdowns, and in the 1970 and 1971 seasons, averaged 26.1 and 24 yards per catch respectively. PS: You may be wondering, as many on the video did, why Hayes was #2, and not #1, here is the NFL’s answer. Posted in Olympics, Pop Culture, Tokyo 1964 and tagged 1964 Tokyo Olympics, Dalla Cowboys, Don Meredith, Gil Brandt, henry carr, John Smith, New York Giants, Roger Staubach. Bookmark the permalink.